This recipe is very simple but messy. We roasted the beets for an hour and removed the skin.When removing the skin from beets, you should wear gloves. The red stains on your hands could make you look suspicious. We sliced the beets and added layers of a mixture made from goat cheese and cottage cheese. 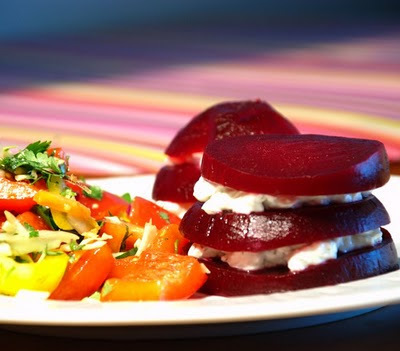 We never thought we would like beets since the only ones we ever had before were the marinated ones. Now they have become a staple item and we use them to sweeten many salads.